Preheat oven to 170°C. Line twelve cupcake pans with paper cases. Sift combined flour, sugar and bicarb into a bowl. Add butter, milk, golden syrup, egg and vanilla. Mix until pale and creamy. Fold in the half of the chocolate bits. Divide mixture among prepared pans. Bake for 25 minutes or until firm. Leave for 10 minutes to cool a little and then transfer to a wire rack to cool. Meanwhile, stir the cream (I used double cream since that's what I had lying around) and the rest of the chocolate in a saucepan over very low heat until smooth. Do not rush this or the chocolate will separate and be ruined. Transfer to a bowl. Cover with plastic wrap and allow to rest for about 30 minutes - until it's not quite so runny. Spread the chocolate icing over the top. 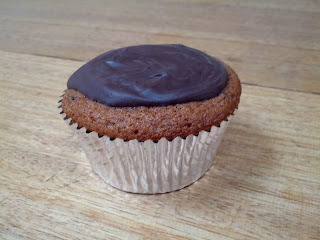 I found that blobbing a dollop on the top and gently tapping the cupcake helped spread the ganache nicely.